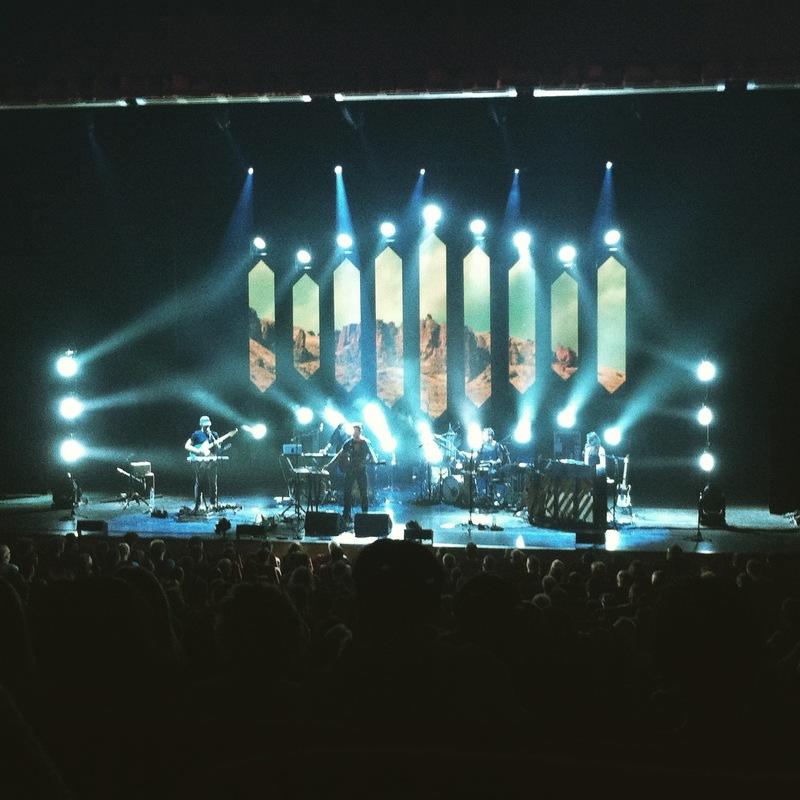 CONCERT REVIEW // Sufjan Stevens // Théâtre du Léman, Geneva, 20.09.2015 – Spirit of my silence I can hear you. But I’m afraid to be near you. It doesn’t happen very often to be able to enjoy a concert comfortably seated on a red velvet theatre couch, so this was quite an experience also under the logistic point of view. Théâtre du Léman in Geneva offers an amazing setting for a concert and when there is a great indie-folk artist called Sufjan Stevens, well it fits perfectly. Basia Bulat is a female musician from Montreal. The first song she plays is one with her voice recorded by the special microphone. She plays multiple instruments, some of which are pretty original. She beautifully plays the piano while singing with her soft voice. She is then joined on stage by Andrew on the guitar for a few songs. “We are from Montreal and now we’re gonna play you something from our favourite montrealer: Leonard Cohen” when the audience hears this name there are many screams of agreement. They play the beautiful “Ain’t No Cure for Love”. At the very end of the set Basia Bulat plays a song on her own on the ukulele singing without microphone showing that her voice can be beautifully heard also without it. Songwriting and folk notes shape up to form a tender music. This was her first time in Switzerland and in Geneva and the public truly appreciated. The theatre hall darkens as the music starts. Sufjan Stevens, on the piano, and his band, composed by three guys and a girl, start the gig with an instrumental intro. After the intro Sufjan Stevens gets to the centre of the stage and picks up his guitar and starts playing the opening song of his latest album Carrie & Lowell (2015), “Death With Dignity”. The first time I listened to the album was enough to make me fall in love with it, with those folky sounds, those lyrics which steal your heart and his magnificent voice. Themes of life and death are ever present in his music as are elements drawing from his Christian faith. Live everything is intensified and Théâtre du Léman has a perfect acoustic sound and offers a stunning setting which seems to fit perfectly with Sufjan Stevens‘ music, or at least at the beginning. He and his band mostly play songs from Carrie & Lowell in the first half of the concert. The songs are accompanied by video footage tracking Sufjan’s childhood and his parents. Carrie & Lowell is in fact a very autobiographical album, starting from its title which reads the name of Sufjan Stevens‘ parents. It was inspired in particular by the death of his mother in 2012 and by the family trips to Oregon. For some other songs instead of the video footage there are pictures of landscapes and as he starts picking on the chords you feel as if you are cuddled by the waves in the picture, his pure beautiful voice leading you in that direction as well. He plays the title track “Carrie & Lowell” which starts with a cute folk intro on the guitar and with a sort of arpège. The first older song that he plays is one from his more electronic album The Age of Adz (2010). He then goes back to concentrate on the latest album. In the refrain of the song “Fourth of July” the phrase “We’re all gonna die” is repeatedly sung by Sufjan Stevevs backed up by the choir created by his two musicians, sort of high pitched or child like. The drums get increasingly stronger until they encounter the other instruments in an incredible outburst of sounds. Space electronic sounds are created as the lights go crazy as well! After a long while everything ends. The audience raises up in a standing ovation for this incredible band clapping and cheering for a long time after they are gone and actually until they don’t come back. Cheering and loud clapping from the audience go out to Sufjan Stevens and his incredible band. He takes a bow as the audience goes on with the clapping and then they leave, the lights are turned off and then on again. The show is over but its uniqueness will live on in our memories.